various organizations in Massachusetts and New England. Interpreting Animal Tracks, Trails and Sign. About presents a bio and background about David Brown. websites that contain good information about animal tracking. 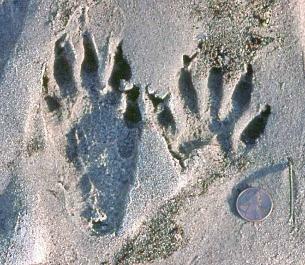 programs and information on animal tracking, bird life and other wildlife materials. Thank you for visiting and check back again. Unless otherwise credited, all images on this site are the property of David W.
Brown and carry either an inherent or registered copyright. Quabbin Trails page or the Sponsored Programs page. Sunday, April 14: Quabbin Tracking. See the Quabbin Trails page for details. Sunday, April 28: Quabbin Tracking. See the Quabbin Trails page for details. Sunday, May 19: Quabbin Tracking. See the Quabbin Trails page for details. a more varied earthen surface. estuaries on their way to northern nesting ranges. the somber landscape of lingering winter.